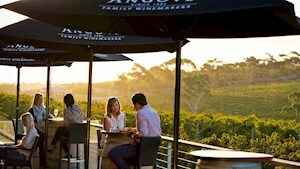 On the northern edge of the Peninsula close to the Adelaide Hills, Kangarilla is an outpost of the McLaren Vale wine growing area with several highly reputed wineries and vineyards. Surrounded by many small farms, the historic township features several buildings of state and local historical significance dating back to the mid-1800s. Sheep graze nearby while you cook a barbecue and enjoy the countryside amid century-old gum trees. See what people are posting about Kangarilla. Some visitors stop here just for the popular bakery but this picturesque village in a deep valley rewards a longer stay.